SMITHFIELD, Va. (AP) — You can't go far in this historic southeastern Virginia town without seeing a pig. A herd of life-size swine statues lines its downtown, an ornament of a piglet wearing a bandanna adorns a front lawn, hams hang in storefronts and a pickup truck flaunts the license plate "PIG TIME." The home of the world's largest pork producer and maker of famous Smithfield hams is divided in its reaction to news that the company agreed to be bought by a Chinese company. The reception is as mixed as whether the locals favor salt-cured or sugar-cured ham. Smithfield Foods Inc. agreed to a $4.72 billion offer from Shuanghui International Holdings Ltd., the majority shareholder in China's largest meat processor. The deal, which would be the largest takeover of a U.S. company by a Chinese firm, still faces a federal regulatory review and Smithfield shareholder approval. Steps from the site where the company was founded in 1936, residents in the "Ham Capital of the World" greet each other on a main street lined with white picket fences and Victorian-style homes, and welcome a neighbor back from a recent trip out of town. Just down the road, workers shuffle into the company's packing plants for their shifts. Looking out on the street that's lined with antique cars every weekend, locals frequent Smithfield Gourmet Bakery and Beanery, grabbing their morning coffee and pastry. Some are shocked that "China would own our Smithfield," said Carolyn Burke, a longtime resident who owns the eatery. "It's Smithfield ham, it's not China ham," Burke said. And she's right: Pork produced here for more than 300 years became so popular that many places in the 1930s tried to pass off their ham as Smithfield ham, which led to branding each ham so customers knew it was authentic. The state even passed a since-revised law in 1926, stating the "Smithfield ham" moniker could only be used for cuts of peanut-fed hogs processed and salt-cured in the town limits. The town also is home to the world's oldest cured ham from 1902 at the Isle of Wight museum — complete with its own brass collar around the hock. As important as the pork itself is Smithfield Foods, which employs about 3,800 people in Virginia. In its most recent fiscal year, it brought in sales of more than $13 billion and made a profit of $361 million. The company, its founding family — the Luters — and those who work there donate time and money to the community, funding parks, public restrooms and other projects. "You either have a family member who works there, or has worked there, or you had a summer job there. It's just such a part of our community," said Sheila Gwaltney, the director of a local arts center and a more-than-40-year resident whose husband's family has been in the area since 1666. 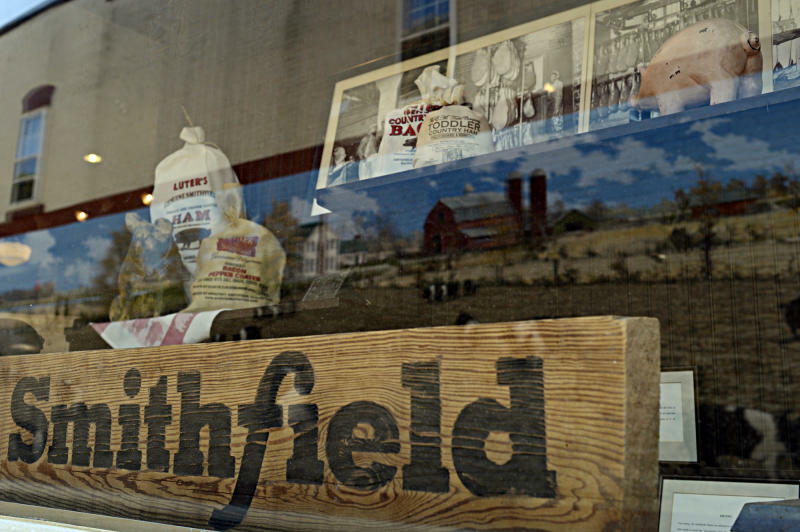 "Smithfield has been so good for the town." With its namesake and well-being on the line, Smithfield native and Mayor T. Carter Williams, 71, hopes the pending sale doesn't compromise the town's identity. "They say that everything's going to stay the same, and we all just hope that it does," he said. His wife, Connie, works at Taste of Smithfield, a hometown restaurant the company opened about a year ago to showcase its products. "We'll just see where it ends up, time will tell." In an interview with The Associated Press, Smithfield Foods CEO Larry Pope said the move showed "the globalization of the world and how it affects small-town America." "But Smithfield, Virginia, has nothing to worry about," Pope said. "We're in a mature market ... and to continue to grow we have to look at opportunities outside the United States." Bob Barnes, who worked as an accountant at Smithfield Foods for about 10 years before retiring, sees only "good things happening" for the company that has had its share of ups and downs over the years. 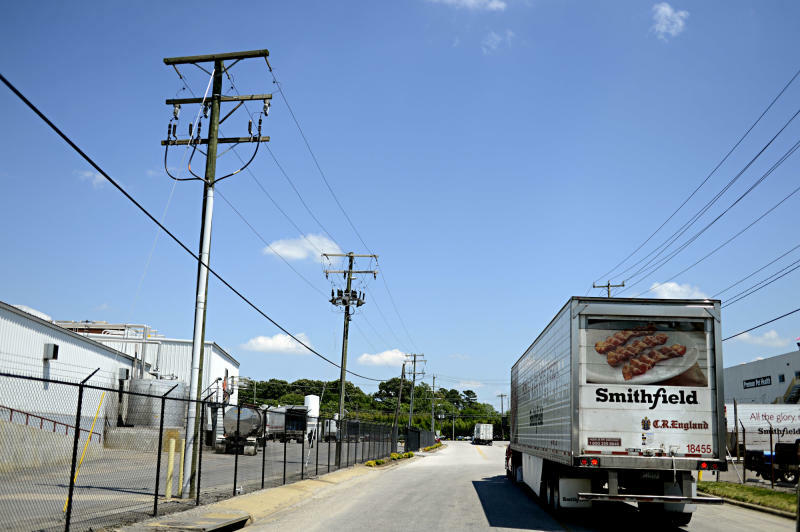 Pork producers such as Smithfield have been caught in a tug of war with consumers. The company needs to raise prices to offset rising commodity costs, namely the corn it uses for feed. But consumers are still extremely sensitive to price changes in the current economy. By raising prices, Smithfield risks cutting into its sales should consumers cut back or buy cheaper meats, such as chicken. In 2009, Smithfield Foods posted its first annual loss since 1975, and again in 2010, but has since rebounded. And one of its largest shareholders had been pushing Smithfield to consider splitting itself up in recent months. "Somebody's gotta own it," Barnes said. "It's just money. It doesn't bother me as long as it doesn't change our philosophy, our life, our politics (and) it doesn't shut down places." Gwaltney agreed: "When you think about it, that should be very good economically for the company ... and what's good for the company is good for us." 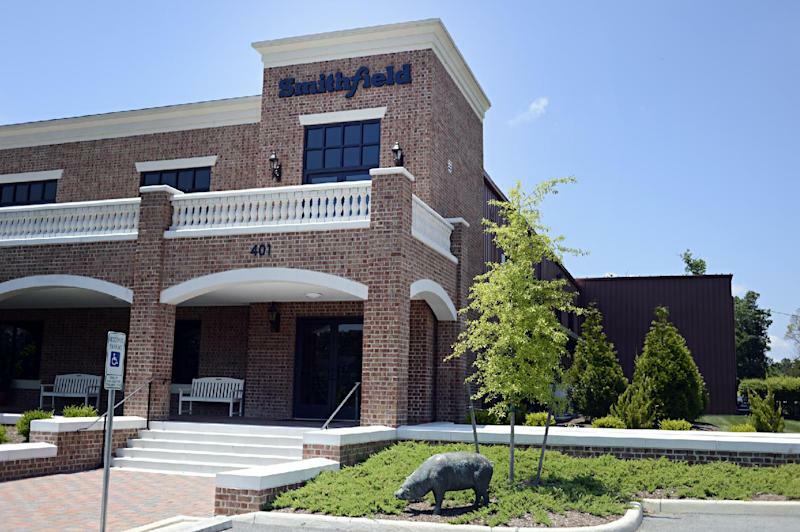 There is at least one drawback that residents note: They'll soon be unable to own Smithfield stock — a tangible piece of the company named after the town that pork built.